Add 4 cups half & half and 4 cups water, to one 14 oz can of cream corn. Now add your corn chowder mix. Bring to a slow boil and simmer for about 30 - 35 minutes till the potatoes are tender. At this time you may add one can undrained crab for a crabbie corn chowder. Whole milk and fat free half & half may be substituted for half & half. Bought this at the Big E. We put more chicken in it and it was so delicious! I want more! 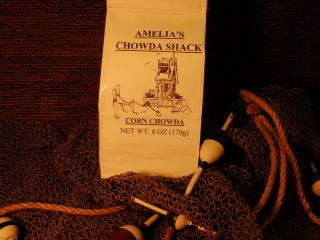 Just had a can of corn chowder and it made me think of this and I was sad and disappointed because it doesn't even compare to how yummy Amelia's Corn Chowda is. I love that I can customize with my own add-ins.